Over the years, Albert Bros., Inc. and all of our employees have shared the same recycling mission of creating an enduring a lasting recycling company. We have seen our business grow because of our hard work, strong relationships with our customers and our community and a vision of how we believe a company should operate. Even amidst today’s economic turmoil, Albert Bros. remains incredibly optimistic about its future. 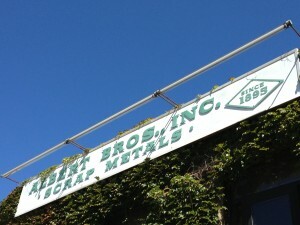 Scrap metal recycling is here to stay and Albert Bros. is passionate about the role they can play in helping to conserve resources for future generations while making our community a better place to live and work. Albert Bros.’ employees, customers, suppliers and business associates know from experience that we honor our commitments and we stand behind everything we do. Our resources and capabilities have allowed us to become one of the largest scrap metal companies in New England. Provide the highest level of customer service available. Commit to fair market pricing and prompt payment. Continue to seek ways to provide cost savings, which we can pass along to our customers. Adhere to the highest standards of integrity. Adhere to the highest standards of safety. Adhere to the highest standards of environmental compliance. Albert Bros., Inc. strives to be a solid citizen. We are proud to be an active part of the community through employee involvement and by lending our direct and financial support to a wide variety of civic organizations and causes.